Flannery travels to the unexplored regions of New Guinea in search of species that science has yet to discover or classify. He finds many -- from a community of giant cave bats that were supposedly extinct to the elusive black-and-white tree-kangaroo -- and along the way has a wealth of unforgettable adventures. Flannery scales cliffs, descends into caverns, and cheats death, both from disease and at the hands of the local cannibals, who wish to take revenge on his "clan" of wildlife scientists. He eventually befriends the tribespeople, who become companions in his quest and whose contributions to his research prove invaluable. 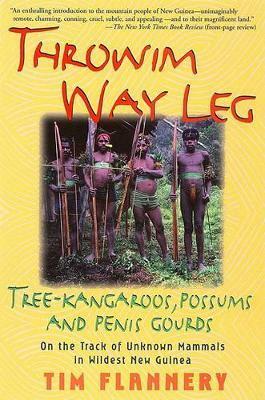 In New Guinea pidgin, throwim way leg means to take the first step of a long journey. The journey in this book is a wild ride full of natural wonders and Flannery's trademark wit, a tour de force of travelogue, anthropology, and natural history.